Who is it right? This is the very Frozen song, let you single cycle all night. If this Best Original Song of 86th Academy Awards - Let It Go brings your memory back to Frozen wonderland? Guess the positive answer accounts for the majority. Maybe you have already rushed to the theater to watch Frozen movie, but when the sweet-sounding melody plays out, most likely you wanna watch this fabulous Disney movie Frozen again. To have a review on this must-watch Disney movie Frozen, You have two options to choose from. Case 1: Frozen DVD available, what will you cope with it. Apt to insert into your computer DVD Drive and watch Frozen movie on computer or apply DVD player to play it? Well, do you know all of these ways to watch will damage your DVD disc dramatically? 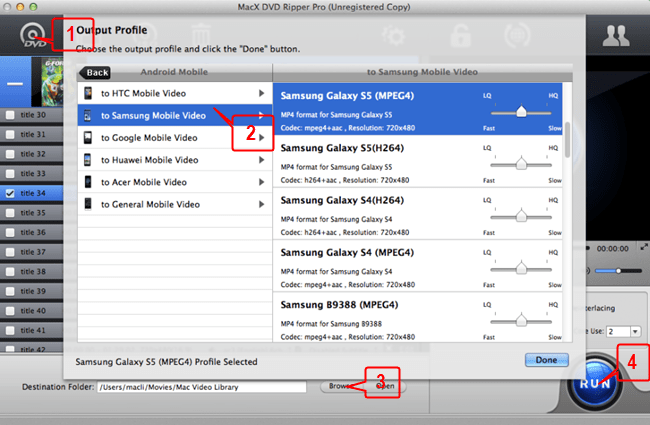 Alternatively, you can rip Frozen DVD to MP4, MOV and more for watching on Apple, Android, Sony devices on the go. Solution: To rip Disney DVD Frozen, as you know, is really not an easy job. You see, Disney DVDs are encrypted by its newest Disney X-project protection that Disney DVD usually contains up to 99 titles so that the ordinary DVD rippers are invalid to pick out the main title, let alone rip Disney DVD. That being said, remember it's not the end of world. Here we highly recommends you a versatile yet solid DVD ripper software - MacX DVD Ripper Pro, which is equipped with advanced tech to rip Disney DVD Frozen to MOV, MP4, AVI, WMV and extract the audio Let It Go music from DVD to be saved as MP3, AC3, etc on Mac OS with thunder light speed and zero quality loss so that you can watch Frozen with crisp yet sharp image and clear sound on iPhone iPad, Samsung Galaxy S5, HTC One M8 on the move. More amazingly, this top-notch DVD ripper is also versed at skirting other encryption like CSS, Region Code, Sony ARccOS, UOPs, etc. Case 2: Providing you don't buy Frozen DVD, watching Frozen movie on YouTube is also a nice choice. Yet, common scene is that the network is always sinking into traffic jam so that it's seemingly hard to watch Disney movie Frozen smooth as butter without lags and buffering. Solution: To tackle this issue, the easiest way is to download Frozen from YouTube and convert Frozen to portable devices friendly formats, and then you are allowed to watch Frozen movie fluently. OF course, you are unable to complete it without the aid of a reliable video converter. 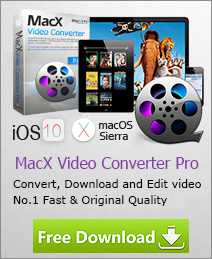 The best video converter appearing on the hunting radar is the feature-rich MacX Video Converter Pro , which is masterful at downloading Frozen movie from YouTube in a jiffy and convert video to MOV, MP4, FLV, MTS, AVCHD, etc. on Mac. It also does you a favor to download and convert music video-Let It Go to your iPhone 5S/C, iPad mini/Air, Galaxy S5/4 just in 30 seconds. Tips: No matter you are an expert or a newbie, the intuitive interface of two programs will walk you through the whole ripping, downloading and converting process. You are solely required to click four buttons, then they will take care of the rest for you and you just import the movie and watch Frozen movie anywhere anytime. This guide aims to help you download and convert YouTube HD videos (720P/1080P/4K HD) on Mac so that you can watch YouTube HD videos on iPhone iPad Android limitlessly.